This quick and easy endive salad recipe has been requested by family and friends countless times and I’m hoping that you will enjoy it as much as we do. Preparing the salad is not really a challenge but you can easily screw it up, and you will never make it again if you don’t do it right for the first time. Let’s first take a look at what I’m talking about, as the meaning of “endive” is often confused. As clean eaters, we can’t gather enough knowledge regarding vegetables. 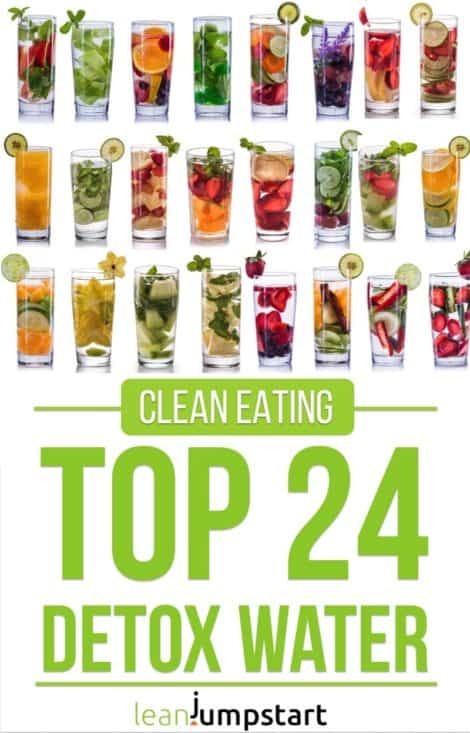 This is especially true if they help to lose weight, detox and strengthen gut flora. I’ll share more about possible weight loss effects after I’ve presented the healthy salad recipe. It is a member of the chicory family, which includes escarole, radicchio, curly and frisée endive. 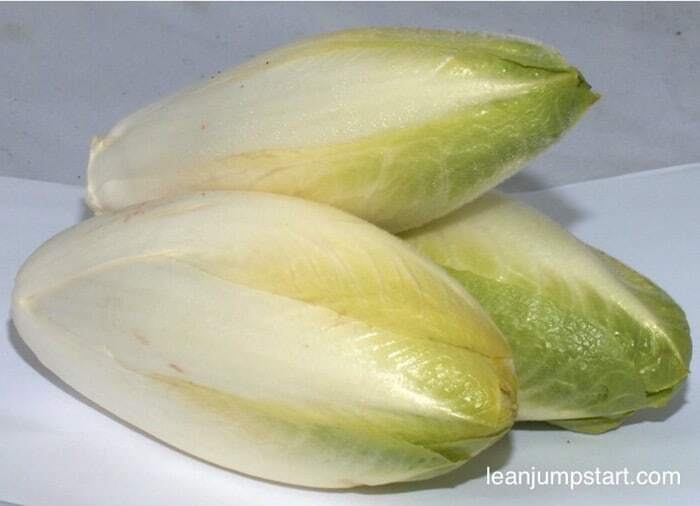 This winter leaf vegetable is often also called “Belgian endive” or “leaf chicory”. Typical are its boat-shaped leaves that can serve as the perfect serving utensil for a variety of ingredients and dips. 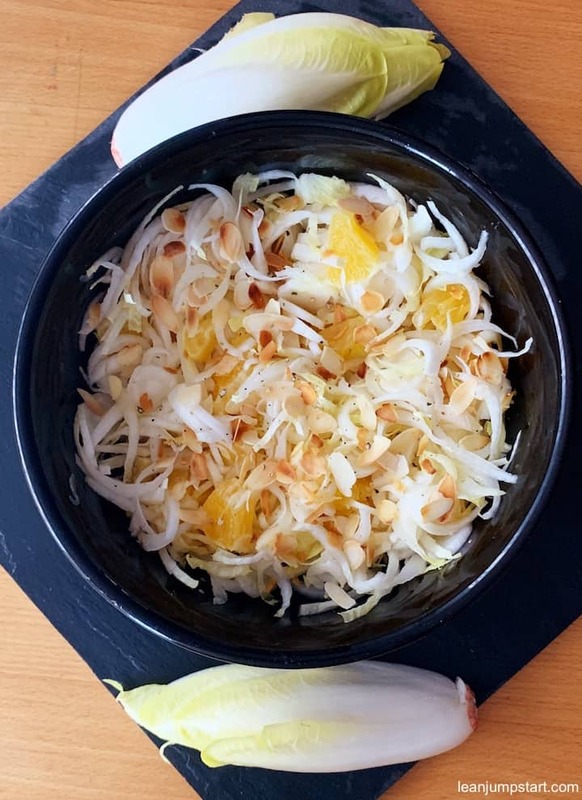 Especially during holidays, you can easily create “endive bites” – those delicious and eye-catching appetizers. I’ll give you an easy recipe idea for appetizers at the end of this blog post. Heads up: Don’t confuse “Belgian endive” with “true endive” including the green, curly endive salad, a different species. For a clean eating salad, most people just combine the leaves cut in slices with a self-made dressing. 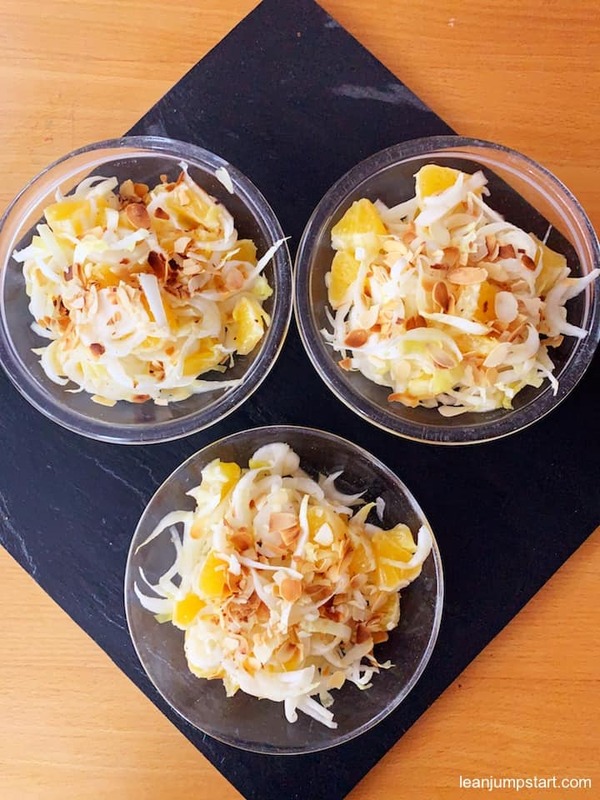 But wait – the result is usually a bitter-leaf salad that is of course very healthy, but it will make it hard for you to enjoy. 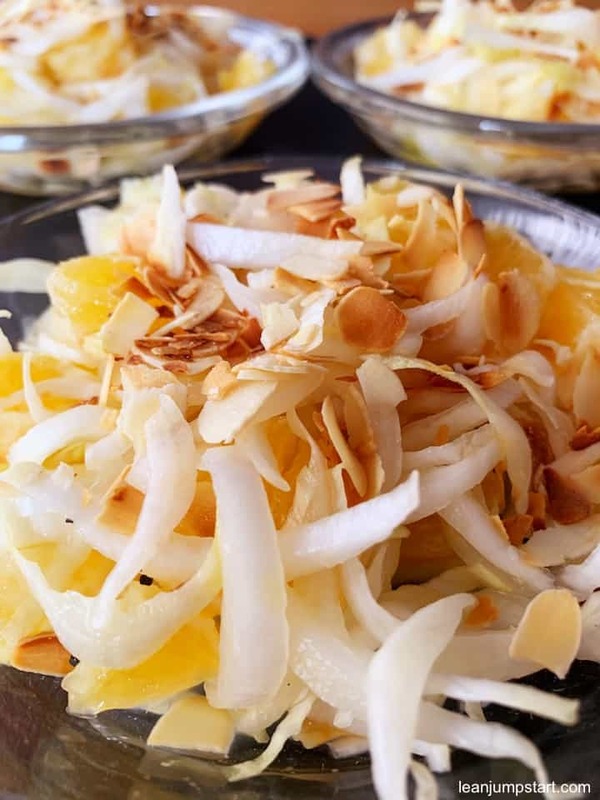 A perfect way to temper endive’s bitter flavor is to mix it with orange slices as I have done in this fresh and light recipe. Separate the endive leaves, discarding the base, slice crosswise 1/2 inch thick. Peel orange and cut away all peel and white pith, quarter and slice. 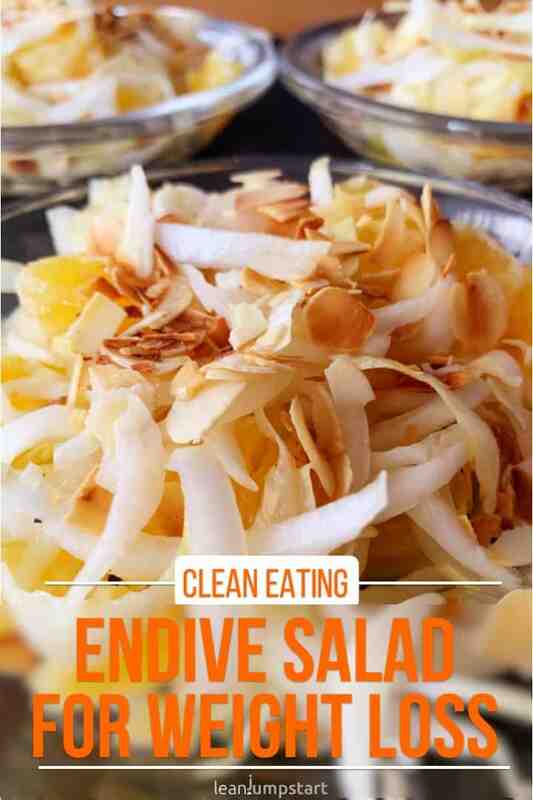 Combine endive and orange slices in large bowl. Whisk lemon and olive oil in medium bowl to blend. Sprinkle with almond flakes before serving. In Belgium, these winter leaf vegetables are also known as “white gold” and that with good reason. This vegetable is flexible enough to be eaten raw in a salad or steamed in a vegetable stir-fry. When looking at its health benefits you cannot serve it often enough. With one calorie per leaf, chicory is a real slimming wonder. The white-yellow-green leaves contain the bitter compound lactucopicrin (intybin), among others. Lactucopicrin activates the liver and boosts metabolism. (1) On top of that this bitter compound is a natural fat burner. It releases nutritional fat for fat burning instead of storing it in your hips, stomach or bottom. If you want to lose weight and feel great in just 5 minutes a day without dieting then check out my 52 Chef Habits Course! The bitter compound can even more. It decreases the cholesterol level, stimulating bile and pancreas to produce a special secretion. This secretion consumes cholesterol in the blood, reducing the damaging LDL-cholesterol up to 10 percent, which again can prevent cardiovascular disease. Another benefit for your heart: Endive contains 135 milligrams potassium per 100 grams, a mineral essential for a healthy heart. Besides of potassium, Belgian endive contains also phosphor and calcium. Our body needs all three minerals to neutralize excess acid. (Acids develop e.g. when you digest animal protein.) In consequence, excess acid can lead to allergies and inflammation. Click through to learn about the numerous health benefits of high fiber foods. Given all those fabulous health benefits of leaf chicory, the presented juicy recipe might be the perfect inspiration for you. Enjoy! A very popular variation is to create blue cheese endive boats. Just combine crumbled blue cheese with small diced pears and some balsamic vinegar. Fill the veggie boats with the blue cheese pear mixture and serve these eye-catching appetizers to your vegetarian guests. So yummy!